This adventurous climb meanders across features rarely found on many Lover’s Leap routes: a huge belay ledge, an enormous featured corner, and super-sized dikes and flakes. While the hardest moves are 5.7, the difficult routefinding and exposed moves overwhelm many climbers and have led to more than a few epics. 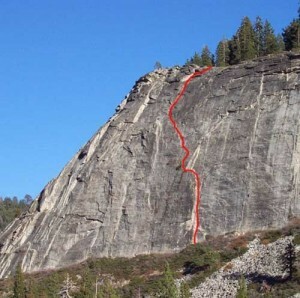 This route is not recommended for fledgling 5.7 leaders. Which SuperTopo guidebooks include a topo for East Wall? FA: Ken and Mike Edsburg, Jerry Sublette, 1964. On the first pitch, stem a big corner with many parallel cracks and great gear.